– Debugging Long distance\low bandwidth\High-Latency Networks Issues. – Comparing few different Network Solution for Performance and Resources. With Wireshark you can (again,) find so much information – So in this next Phase i’ll narrow it down to the ‘Big Ones’ it’s important for everyone to know! Is the amount of time takes a packet (or several) to travel from one end of the session to the other and to be acknowledged. This Parameter is important because it may indicate a ‘slowness’ in one of the network nodes. The amount of data being transferred by the session over the network in a specific amount of time. Most Network links are limited for this parameter. Mostly by the ISP \Corporate Q.O.S (Quality Of Service) \ Network Gear. A ‘TCP Re-Transmission’ is a packet sent by one end of the session, if it didn’t get the Acknowledgment in time. Similar to a ‘Packet Loss’. High amount of those (more than 10%), Usually indicates a serious Issue and the Session will be very slow and unstable. How do we measure those with Wireshark? 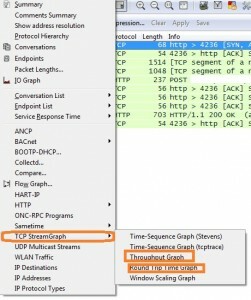 Very simple, After capturing the traffic and filtering your session (right click > Follow TCP Stream). Now you’ll see the best looking Graphs you have EVER seen! And you will see number of Displayed packets should be less than 10% from total number of packets. I promised you a Real recent example, and here it is. Recently, I wanted to ‘put some numbers’ that show how CloudShare’s feature of ‘Accelerated RDP’ is really much better than regular RDP Session. Left Graph is ‘CloudShare Accelerated’ RDP Session, Right one is Regular ‘Direct’ Session. With CloudShare’s Accelerated RDP Session, I was able to cut in half (!!!) the amount of time traffic was getting from my PC to my machine in CloudShare. Hope you have Enjoyed this post, And that it was informative to you. Now, Try Wireshark for your use case – It is Great!